The optics laboratory contains a suite of instruments for characterizing optical sources, particularly lasers, and the optical properties of materials. Some of these instruments are connected by single-mode optical fiber to JILA research groups laboratories. The fiber links allow the instruments to be used remotely. The results are read back from a server over a new high-speed local area network installed as part of the Keck lab. 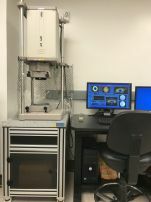 The measurements performed by some instruments do not allow intervening fiber; these instruments are located on carts so that they can moved into research labs. Others remain in the Keck Laboratory. The optics lab is also used for teaching alignment and operation of ultrafast lasers. 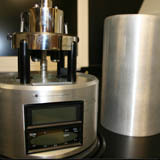 Used for profiling features and determining critical dimensions on substrates as large as 6" in diameter. Stage Travel: 4" x 4"
Scanning probe microscope used to characterize surfaces with atomic resolution. Displays the spatial profile of a laser beam and beam propagation information (cart). Determines the thickness and optical constants of thin dielectric films. Used to characterize optical coatings. Used for straight and angle cleaving of fiber optics. Produces very low loss splices between optical fibers by fusing the fibers together. Wavefront analyzer for characterizing the flatness of optical elements. Used for measuring emission spectrum of a sample as a function of excitation wavelength. Allows the complete electric field (amplitude and phase) of an ultrashort optical pulse to be determined (cart). Used for routine light microscopy. Measures wave forms in the time domain. An optical to electronic converter allows it to monitor pulses produced by lasers (fiber). Allows different labs in JILA to be connected to the fiberized instruments in the Keck Lab. Also allows JILA labs to be connected to one another. The top portion of the cabinet is occupied by high-speed network switches to allow remote access to the measurement results. Located in B131. Measures the polarization state of a laser beam and displays the results in real time on the Poincar� sphere (cart). Provides a frequency domain characterization of electrical signals. An optical-to-electrical converter allows use with lasers. Useful in measuring the beat between two lasers. This laser is stabilized to Iodine to provide an absolute frequency reference at optical frequencies. Measures the transmission and reflection properties of optical elements and materials from the ultraviolet to near infrared wavelengths. Measures the frequency of a laser with an accuracy of 1 megahertz. For use with stabilized single frequency lasers.